Rice flour is a staple food in Southeast Asia, Japan and southern India according to “The New York Times.” During the milling process, grinding flour is one way to make use of any damaged or broken grains. Production of this rice flour may include both white or brown rice — each works well for commercial products or home baking. While various types of rice flour are popular internationally, Comet Rice, a company that specializes in rice products, lists long-grain rice flour as the biggest seller in the United States. Gluten is a protein found is grain products such as wheat and rye, and its avoidance is an essential part of managing celiac disease. Celiac disease is a digestive condition that triggers an immune system response to gluten. Research regarding the effect of gluten for those diagnosed with autism is inconsistent; however, some parents have eliminated gluten from the diets of their autistic children as a precaution. 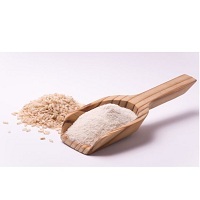 Rice flour is a suitable and healthy replacement for wheat flour if you must maintain a gluten-free diet. It is high in protein according to the website Recipe Tips, which notes that flour from brown rice contains a higher level of B vitamins. The primary difference between brown and white rice is the husk — during milling, removing the husk produces white rice. However, the husk of brown rice is left intact, making it a good selection when considering fiber, vitamins and nutrients such as calcium and zinc. Dietary fiber is an essential part of any eating plan. Rice contains insoluble fiber, the substance that helps waste material move through the intestines. MayoClinic.com reports that a diet high in fiber will lower cholesterol, improve blood sugar levels and promote regular bowel movements. Brown rice contains more fiber than does white due to the husk. Substituting brown rice flour for wheat may help with weight loss — a diet rich in fiber helps you feel fuller and reduces hunger. By adding more fiber to your daily meal plan with rice flour, you may lower your risk for developing some medical conditions, such as diverticular disease, colon diseases, type-2 diabetes and hypertension.